Place the apples, 50g sugar, cinnamon and water in a saucepan. Cover and cook gently for 5 minutes. Add blackberries, and cook for a further 3 minutes. Meanwhile, melt the butter with the remaining sugar in a large frying pan and fry the breadcrumbs and oats for 3-4 minutes. 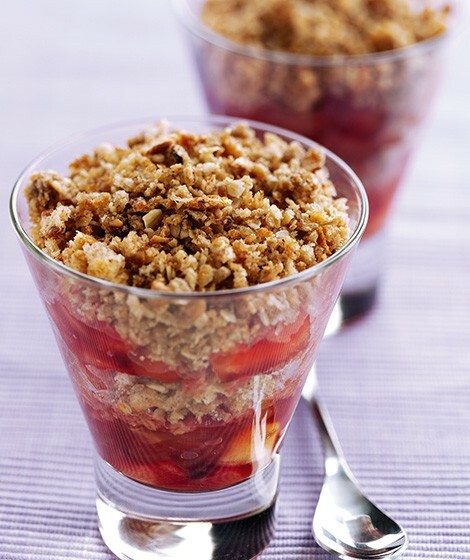 Spoon half the apples into 4 wine glasses or bowls, spoon over half the breadcrumb mix. Repeat with the remaining mixtures. Serve with low fat crème fraîche.